If you have deep facial wrinkles along the folds of the nose (smile lines or nasolabial folds), sunken eyes, loss of natural collagen, deep scars or thin lips, you can restore fullness and volume to these areas through the use of Juvéderm®, Restylane®, and Perlane®. These dermal fillers contain hyaluronic acid, a naturally occurring substance in your body. These fillers maintain their shape and provide lost fullness to skin areas by binding with your body’s own moisture. Although collagen was the initial facial filler and was once considered the state-of-the-art filler, it is no longer available since these other fillers work better and last longer. A flexible gel-like substance, hyaluronic acid dermal filler can flow when injected, giving a smooth look to the face, deep scars, or the lips rather than the stiffer, lumpy appearance that was associated with collagen. Dr. Mudd also prefers natural fillers to reduce the possibility of allergic reactions, which can cause red lumps under the skin. Whether combined with MicroLaserPeel™ and Botox® in a layered complementary approach to dramatically reduce the appearance of age-creating skin folds and deep skin scars, or used to enhance thin lips, the dermal filler allows you to maintain a natural look with minimal recovery, yet with immediate and lasting results. Dr. Mudd was the first physician in Central Ohio and among the first in the state of Ohio to perform the non-surgical filler thread-lift, after learning this technique from the originator of this specialized technique. She also uses these fillers to perform the Liquid Facelift. Both of these special techniques can create immediate dramatic improvement without any downtime. 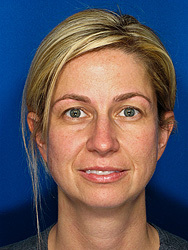 Dermal filler patients love to leave the office looking 5-10 years younger! If you are interested in learning more about what Dermal Fillers can do for you, call 614-888-6833 today to schedule an appointment. Dermal fillers are injected to fill creases and lines, and give excellent results in all areas with fine lines. The effects last 6 months or longer, since all dermal fillers will slowly dissolve out of the system. Fillers work by injecting the gel below the line, which pushes the depressed skin crease upwards to level it with surrounding skin. The fillers are FDA approved for use on the face and work great to improve sunken under-eye areas, brow position, nasal bridge creases, the 11’s (deep creases between the eyebrows), smile (nasolabial) lines, Howdy Doody (marionette) jowl lines, sunken cheeks, chin creases, and irregular jawlines. Dr. Mudd also uses fillers to perform the non-surgical filler thread-lift, which lifts sagging facial skin without surgery, as well as to improve the appearance of bony hands. The injections are given using the finest gauge (smallest) needles made. Patients may opt to have topical anesthesia applied 30 minutes before the injections if you are worried about injection discomfort. Each filler syringe also contains lidocaine to provide local anesthesia within minutes of the injection. Some slight bruising may result depending on the person’s physical tendencies. Slight swelling and temporary redness may occur after the needle is injected but this resolves in a day or two. It used to be you had very little choice in dermal fillers. All of the ones that we offer have similar characteristics but they can give slightly different results depending on the application and the person. In consultation with you, we can determine which filler is right for you!